Do you feel like making a splash right into August and the hottest month of summer? Yeah, sure! But you’re also thinking about cooling off and beating the heat – and that’s where 100 FREE Crystal Water Spins come in handy! Deposit as little as $25 and you’ll be spinning the reels of Crystal Waters with up to 100 FREE Spins. Take a dip and swim alongside wins, Turtles, a School of Tangs, a Seahorse, a Seashell, Dolphins and other watery images. 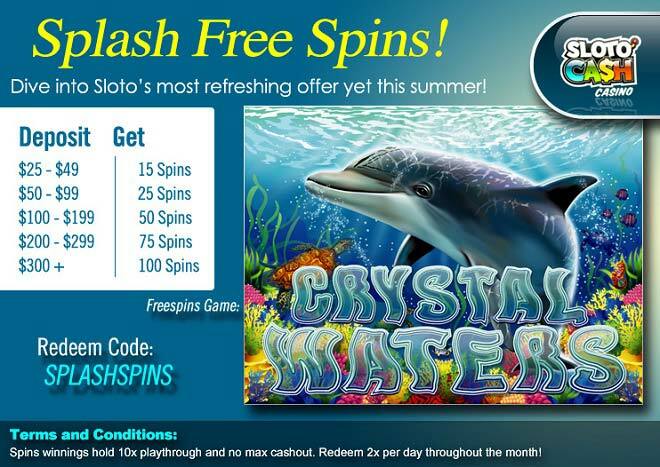 Lounge by the calm waters that August brings to your Sloto account and simply wait for the wins to blow your way with the help of up to 100 Free Spins!